Ghaif Flying Bird mirror wall mount stereo posters on the wall in the living room sofa bedrooms are simply decorated animal sticker silver color. Easy to apply, removable, durable, pressure resistance, shock resistance, moisture resistance.Use in bedrooms, living rooms, playing rooms, study room and home decorations. Decorate interior walls, windows, and furniture and will adhere to most hard,smooth, clean surfaces such as mirrors, metal, wood, and walls.Can be applied to many different types of surfaces.Non-toxic, environmental protection, waterproof. Note: As the sticker is big, so we will ship it fold. 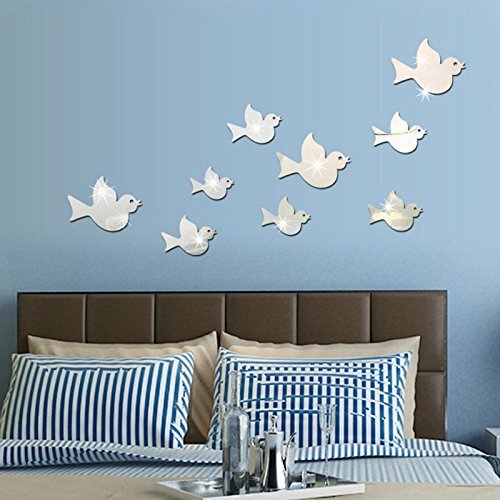 This wall decal will create an affordable design impact to any room. Wall decals are removable and repositionable making them very easy to position on the wall. View More In Wall Pediments. If you have any questions about this product by Ghaif, contact us by completing and submitting the form below. If you are looking for a specif part number, please include it with your message. Ghaif Flying Bird mirror wall mount stereo posters on the wall in the living room sofa bedrooms are simply decorated animal sticker in red.